Chicken is one of America’s favorite foods, so much so that every American ate an average of 84 pounds last year. Although it’s a great go-to ingredient for a family dinner, it’s easy to get tired of the same old chicken recipes. To help combat chicken fatigue, Hellmann’s® mayonnaise has teamed up with Chef Tim Love to launch the “Chicken Change-Up,” offering simple and family-friendly recipe ideas, tips, and tricks to help inspire parents when preparing the nightly meal. 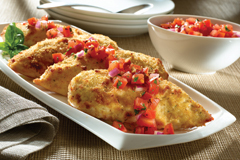 Whatever your dinnertime challenge, with recipes such as Parmesan Crusted Chicken and Baked Buffalo Chicken, mayonnaise can transform your chicken into a juicier, crispier, more delicious meal that the whole family will love. For a fun twist, serve cooked chicken strips on wooden skewers. Also terrific with mayonnaise.